BROKEN ARROWâ€”Vicky Hurst, a 17-year-old high school senior from Melbourne, Fla., got a sponsorâ€™s exemption into the SemGroup Championship and isnâ€™t squandering the opportunity. Which Vicki almost was. Back to that later. Vicki is at present playing her rookie year on the Duramed Futures Tour. At present, Vicki is #1 on that tour’s money list. If you think Vicki has played the LPGA pros a great many times before the Semgroup, think again. Vicki, who has had a very impressive amateur record, is only playing in a LPGA event for the second time on a sponsor’s exemption. How many sponsor’s exemptions has Michelle Wie gotten since 2002? Like 30? Hurst is just one part of the wave of Korean-American girls who will soon be influencing US Ladies Professional golf. Vicki’s Mom Koko, who caddies for her daughter but not this week, was born in South Korea. I think we’ll be hearing alot of more of Vicki, Kimberly Kim, Jenny Shin, and others in the years ahead. The rest of the Tulsa World article is below the fold. Hurstâ€™s mom, Koko, was very pregnant with Vicky back in June of 1990. Koko was playing a round of golf at Andrews Air Force Base in Maryland and made it as far as the 16th hole. â€œI was ready to hit the ball,â€ said Koko Thursday. Then Kokoâ€™s water broke and Vicky was on the way. Considering the way Vicky came into the world, itâ€™s no surprise she graduated to professional golf before graduating high school. 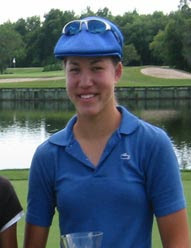 Vicky, the 2007 AJGA Player of the Year, is the sixth consecutive player of the year to skip college and turn pro. She joined the LPGAâ€™s development league and last week set a Duramed Futures Tour 54-hole scoring record while earning her first pro victory. The competition is major league at Cedar Ridge this week, but Vicky played like she belonged amid the worldâ€™s best golfers. She said it was â€œawesomeâ€ to see her name atop the leaderboard. â€œI think she knows she is good enough,â€ said Koko, who travels with her daughter to tournaments. Vicky did not make the cut while playing as an amateur in three previous tournaments against LPGA competition â€” two U.S. Opens and the 2007 Ginn Open. She played in the Ginn Open nearly a year after the death of her father, Joe. Vicky said she was not nervous at the start of the first round. She admitted to being a little nervous toward the end of the round because she wanted to post a good score. Vicky is juggling coursework and class work with the intent of graduating May 17. Teachers and administrators at Holy Trinity Episcopal Academy have been flexible in allowing her to do correspondence work and take make-up exams. She regrets that she didnâ€™t get to go on a senior class outing to Disney World, but sacrifices have to be made if you are golf â€™s next big thing.